We use the latest generation microfilm scanners to digitize microfilm of all types, including 16 mm, 35 mm, ANSI C cartridge positive or negative, silver / vesicular / diazo, simplex / duplex, COM, portrait (cine), landscape (comic), etc. Most microfilm scanners attempt to capture individual frames at scan time. However, they can miss frames when the film is inconsistent, which it often is. Our microfilm scanners scan the entire roll of microfilm including areas in between frames. We can then interactively review the results to manually capture any frames that would have been missed. We also adjust the image quality to compensate for the film density changes throughout the roll. The Customer Portal allows you to search for and consult the status of every microfilm processed by ScanFactory at any point in time (e.g. In Transport, in Scanning, etc.). The Portal also makes it possible to make requests for on-demand or urgent scanning or physical delivery of a particular microfilm, and view full history of such requests. All information and metadata about your microfilm, including its exact physical location, are stored in the SRP database and can be retrieved on-demand. Microfilm conversion is a multi-step process. We begin film scanning by selecting sample reels, inspecting them and scanning a small number of images to properly calibrate the equipment to optimal processing settings that produce the best possible images. The settings are saved in a template before full-scale production commences. We inspect the film to identify scratches, tears, reels without headers, check for vinegar syndrome or redox, remove surface obstructions, etc. If problems are found, we follow previously agreed corrective actions or, if necessary, notify you. Reels that fall beyond the range of pre-set processing parameters for optimal legibility will be individually calibrated. Standard settings are only used for rolls that fall within the acceptable range. Most microfilm scanners try to output images on-the-fly as the film passes through the machine. This only gives the scanner a single opportunity to perform its frame detection (the process during which the machine recognizes individual frames on a section of film and segments them into separate image files) as well as other necessary computer-intensive tasks such as deskewing, cropping, sharpening, etc. If there is a change in the density of the film (the difference between the lightest and darkest images), an image may be cut in half by a misfiring frame detection process or even skipped entirely. Fixing these types of mistakes requires the identification of a skipped frame (no easy task on a roll containing thousands of images), finding it on the physical roll (even harder), re-scanning it properly, and manually inserting / replacing the re-scans in the original batch of images. This is a very time-consuming and expensive process, which is why most service providers don’t do it. 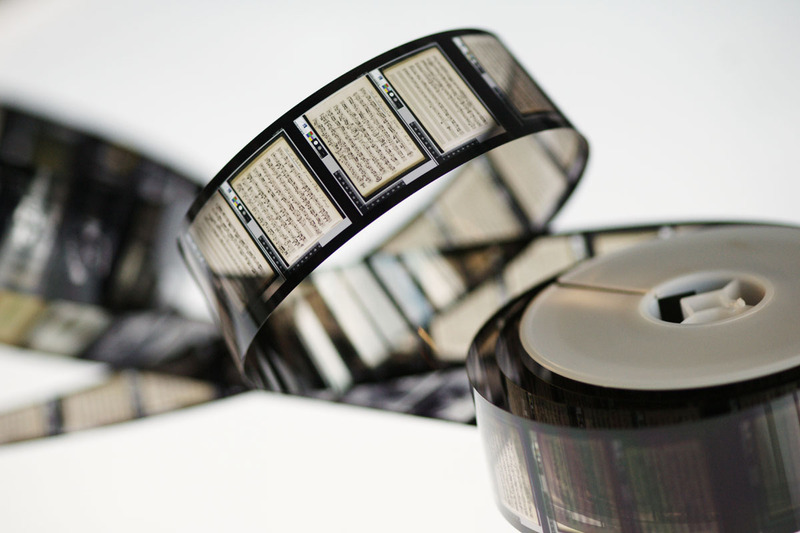 By capturing each roll of microfilm as a continuous “ribbon” which includes all the empty spaces between the frames on the film as well as the frames themselves, we are able to perform frame detection as many times as required in order to perfectly capture every frame on the roll. Frame boundaries can even be re-drawn by the ScanFactory operator by simply dragging them with a mouse. Our operators spend the majority of their time on quality control and tweaking images before they are output (not after), so there are no mistakes to correct in the final images. We audit the quality of separate images and, if corrections are needed, they are done immediately. Final quality control confirms that all the above steps have been correctly implemented. In addition, our SRP system has built-in quality control features (as do all scanners used at ScanFactory). Our Quality Supervisor is automatically notified by the SRP of any quality issues. We also perform a number of automated and manual image enhancement functions, such auto white balancing, manual or automatic image rotation, cropping / trimming of edges (r.g. black borders), auto framing, splitting of 2-up frames into individual pages, auto deskewing to remove the slant of an image that prevents it from being perfectly squared on the page or screen, preserving / removing backer board or blip counter digits, etc. Importantly, the SRP Image Enhancement module utilizes a 16-core server dedicated exclusively to post-scan image processing and performs a series of complex algorithmic image enhancement tasks. Last but not least, our employees are trained to apply ISO 9001 Quality Management principles in all their work. We get it right the first time, and guarantee that we correctly capture 100% of the frames on every roll of film sent to us. After the microfilm scanning is complete, we can index the scanned documents by matching to any existing databases such as CAR databases (Computer Aided Retrieval), by manual keying, or other methods. Additional services include OCR for text searchable PDF files, unitizing images into documents, and preparing images and index information for import into your back-end databases and systems, such as your DMS, or any other applications. What would you like us to do with your microfilm once scanned? Microfilm Vault is a specialized service package that we offer to customers who wish to outsource long term storage of their microfilm archive and have it converted to digital format on-demand. Microfilm is subject to very specific storage requirements. It also requires special equipment to read data off the film. We recognize that many customers would prefer that an experienced service provider handle these specialized tasks. We will store your microfilm archive in our safe and secure Microfilm Vault. We will give you access to our Customer Portal where you can search through your entire archive and request a particular microfilm to be scanned, indexed and delivered to you securely in digital format. Let us take care of your microfilm for you, it is safe with us!